Earn 79 points to spend on future purchases. The updated Nasal-Aire II "cannula style" nasal CPAP mask is an innovative interface featuring laminar flow technology designed for maximum efficiency and comfort during therapy. Its sleek "cannula style" design allows the user freedom to speak, eat, drink, and wear eyeglasses without removing the device. 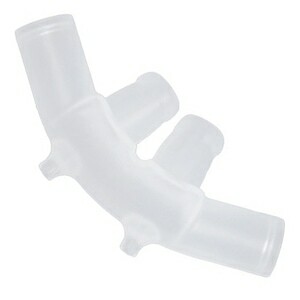 The Nasal-Aire II has no hard frame or forehead support so it eliminates almost all contact with the face. It can be worn for any duration without discomfort or pressure points and it's virtually leak free too! 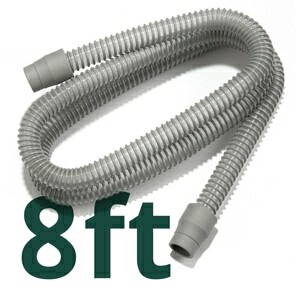 The minimal parts are easy to assemble and clean; and the built in swivel at the end of the Nasal-Aire II's tubing helps prevent kinks and pulling from your main CPAP breathing tube. The Nasal-Aire II's design is so unique that you really can wear it your way. It can be worn with or without headgear and you can add or subtract headgear straps depending on your own personal preferences. In addition the mask tubing can be channeled down the back, away from the head, or down the front of your body so that no matter how you sleep your tubing won't interfere. Nasal-Aire II Mask Packs are available with six different nasal pillow sizes from Extra Small to Extra Large so they'll fit a very wide range of users. If you're not sure which size will fit you best upgrade to a FitPack in your shopping cart. Nasal-Aire II FitPacks include all six prong sizes -- Extra Small, Small, Medium, Medium Plus, Large and Extra Large -- so you can try each one out to find your absolute best fit! In the Package Nasal-Aire II Mask, Nasal Prongs, and Headgear for Optional Use. Been using this style headgear for many years. This headgear is very comfortable and works very well for me. I like that there are various size nasal pillows that you can get to be sure you have a good fit. 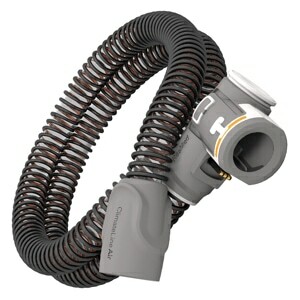 If you're using a mask and are not happy with it and not using your CPAP because of it, try one of these instead. The small Cannula won't even fit my nose,very hard to put the head gear on. I am satisfied with the product. The disappointing part is having to pay $54.82 import tax because it a medical item. I have ordered from your competition before and did not have to pay this. It would be nice if this is shown on your website in the payment section so it is not a surprise. I learned a good lesson. I will call customer service the next time I order. I have spent $$$$$ trying to find a mask that would allow me to sleep without my claustrophobia standing in the way. This prong mask has don't it! I ordered the multisize version. It would be nice if they were labeled so I could tell which size to order next time. It fits slightly differently than the old one I had, but otherwise is great. I much prefer the Nasal Aire to full masks. I've used other nasal masks, but this is the one I've used for over 10 years. I sleep on my side and this works well for both back and side sleepers. the different size nasal prongs helps to find the right size for you (the first time you buy), then you know which size to order next time. I highly recommend this and hope they don't stop making/selling it. Good if you have a stuffy nose. It was head and shoulders about any other nasal mask when it first came out. I used it for years. Then I tried the P10and I love that one, mostly. Now this one feels heavy and cumbersome and the tubes keep me from side sleeping. What it does do better than the P10 is keep my nose un-stuffed. The prongs that sit inside the nostril seem to deliver the air better. 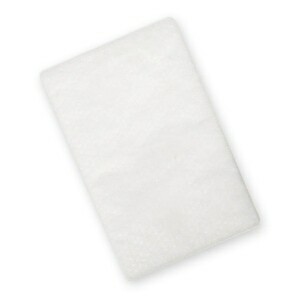 I bought this one to use when I have a cold or allergies that cause my nose to be stuffy. This is worst mask I have used since switching to a nasal pillow mask. I have tried adjusting it several times but even if it starts out okay it shifts while I am sleeping waking me up to adjust it so I can get back to sleep. This headgeAr manufacture because it does not mess up my hair! I was very hopeful that the nasal style would work better for me, but it doesn't. Cant get it to stay on unless I sleep on my back. This is the only mask I have used during the 14 years I've used a CPAP. I'm really hoping they don't stop making them. I don't wear any head gear at all, just the tube and a small strip of velcro across the back to hold it on. The packaging of 6 different size Nasal prong sizes is wasteful and expensive. As for the connection I had 2 that kept popping apart while I was sleeping. It was past the warranty. My loss. I have been told that this mask delivery method is old and I suspect it may have suffered from drying in the connection. I have used the mask and had a hard time with it. Though would try this nasal cannula. First of all the headgear is a disaster for a side sleeper. The pressure points make it almost impossible to sleep without feeling like your head and ears are in contact with a golf ball. They make it worse by needing to be a strap engineer to put it together which you do after each use. The noise is twice as loud as other mask I have used over the years. That alone keeps one from sleeping well. The hose is another story. it is to large and stiff. Where the head touches the pillow again as with the headgear you feel every pressure point. I started out with it for several days and within an hour, went back to my old mask. Might be a good item if they would get it together and do a headgear and tubing system that doesn't make your head feel like it is laying on golf or bowling balls at pressure points. I'm reading these reviews and I can't believe they are talking about the same product. I've used Nasal aire II off and on for 6 or 6 years and I always go back to it. It has the best feel for all night sleep of all the masks I've tried. after 3 or 4 hours I usually give up on pillows or small masks because my average pressure for 90% of the night is 18. I just fasten it behind my head. This is a great mask. I like the cannula part of the mask. I do not like masks that come across the bridge of my nose and I have had a hard time getting a pillow type mask to get a good seal and deliver air. The nasal aire II has two main issues. The tubing is too bulky and too stiff. Also the vent ports need diffusers on them. The headgear needs a way of attaching directly to the cannula part. I hope development continues on this style mask. Hard to get cannula to rest comfortably as well. I found the nasal aire to be very comfortable to wear. However, there is absolutely no diffusion for the air. My husband would never get his sleep because of this product. I'm very surprised that this mask would be popular at all. I will be returning the mask the first chance I get. I thought a mask resembling a nasal cannula would be terrific but it was probably one of the worst mask I've purchased so far. I tried it for 3 nights, pulling it off each night after only a few hours. The major problem is how loud it is (air released from the tube). The tubing is also just too large to try and mimic a nasal cannula. Very disappointed the hoses are HUGE not like you would expect or as they appear. Prongs are uncomfortable and the headgear is a joke. I love the idea of the nasal cannula and it fit well with out being bulky. The problem I found is that the hoses that attached to it were so stiff and inflexible they would pull the cannula out of my nose. I bought this because it appeared to be simpler than my current cpap air pillow. But, it's actually more cumbersome, less comfortable and more frustrating. I cannot recommend this at all. Most comfortable set up I have found in the 15+ years of CPAP use. I really like this mask as it is light and doesn't get in the way much or feel closed in. It arrived ahead of schedule. The problem with the pillows is they don't stay tight your nose and the end up leaking air. Wish this particular product had different nose pillows. The transaction went smoothly and the Mask got here sooner than expected. I almost bought another swift fx, but after reading reviews, I thought I would give it a try and see what all the fuss was about. Very comfortable. make sure you buy their all size set up first. Very comfy, very nice for side sleeping. Two thumbs up! This product arrived with 4 nasal prong pillows plus headgear. It got here in record time. I have used the Nasal-Aire for many years. It is the only "mask" that I have found comfortable. It is easy to sleep in any position and does not get in the way of turning over in bed. I can understand why some people might not like it, it takes getting used to. I have and would not change to anything else. The connector brok after 3 nights of wearing Would not recommend. I have been using this mask for several years and find it very comfortable while I sleep. This device would not seal around the nostrils ( even when the projections were almost puncturing the inside of the nose).This should be taken off the market. I was intrigued by the sales promotion ( the sales team should get a giant promotion) but in reality the device is hurtful and unuseable. I have used this style for years! They last a long time, they are comfortable and easy to clean. I don't use the headgear, just the strap behind my neck and the bolo strap to keep it snug. Direct Home Medical is the cheapest place to buy them plus the free shipping was really fast.